WordFly automatically removes duplicate addresses from your lists. Learn more in this support article. WordFly imports the first address included in your list and suppresses any duplicates after the first unique address is imported. 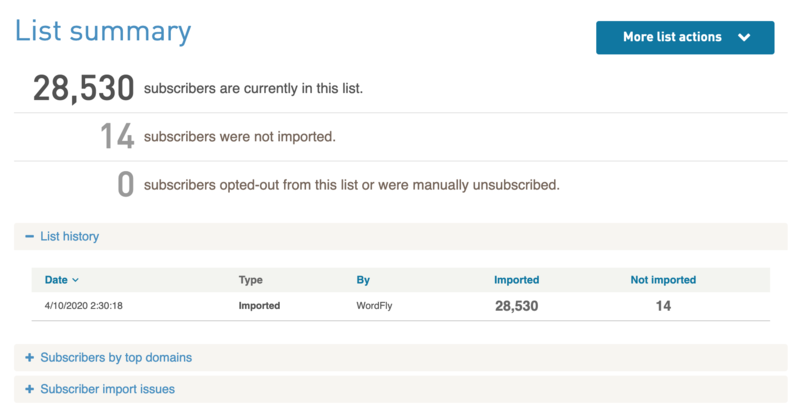 WordFly removes duplicates to help your emails get delivered to the inbox and to ensure your reporting results are accurate. There are several reasons for this. Some ISP's frown on the same email coming to the same address at the same time. Duplicates may cause your emails to get blocked. Subscribers may not realize they signed up twice and multiple emails could cause frustration and result in unsubscribes or abuse complaints. Sending emails to the same address multiple times may also cause higher reporting and engagement rates. This would skew your reporting data and make it less accurate for your true subscriber total. Duplicate totals will display under the List History section of your List Summary page. It is not possible to export duplicate addresses from WordFly at this time. For customers using one of WordFly's CRM integrations (Example, Tessitura or Centaman) the same rules for duplicates apply: The first address on the list is imported and the others are suppressed. The address that is imported will be determined by the order of the list data being supplied by your CRM. If you have questions about the order we can save a copy of your original list imported from the CRM to analyze the order of the addresses. Email support@wordfly.com to investigate further.